The main stem of the Delaware, 331 miles from Hancock, NY, to its mouth at Cape May Point, NJ, is the longest free-flowing river in Eastern United States. Although it drains only 1% of the nation's land mass (13,000 sq. miles), the river supplies water to 10% of the American population: 700 million gallons of water every day for over 20 million people. While the human population in the river basin is larger than that of 40 states, the Delaware supports an astounding array of wildlife and supports the largest winter populations of bald and golden eagles in the East. Floating on this river is lots of fun. From the junction of the East and West Branches in the New York Appalachian Plateau, 21 miles south, the pristine river flats host an abundance of wild life, and eagles are not an uncommon sight. From Hankins, the Delaware begins to drop rapidly through riffles and rapids separated by short pools. At Narrowsburg the river reaches its deepest point (113 feet), and, edged with high cliffs, begins its most remote segment to Barryville. The next 17 miles to Matamoros are a roller coaster of rapids, which in spring can take less than five hours to traverse in a raft. 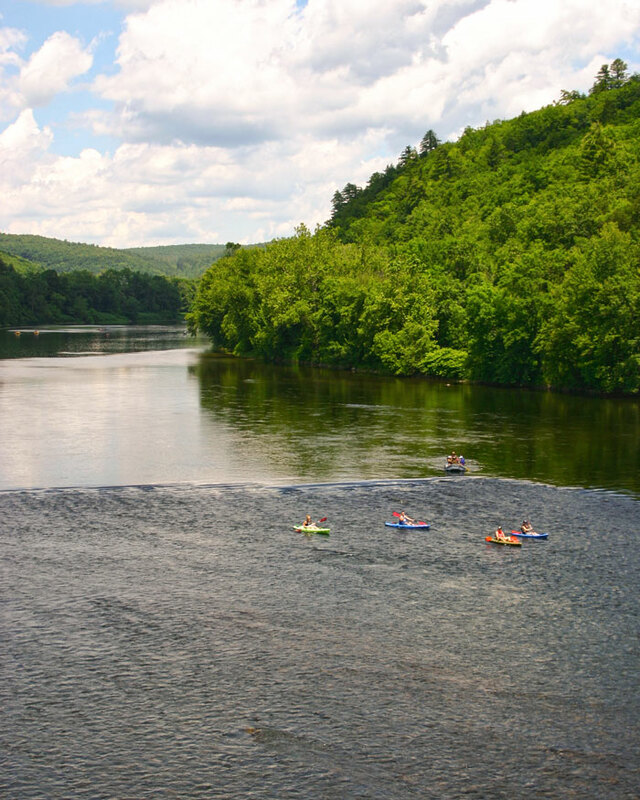 A little past midway on this stretch, the Mongaup River enters the Delaware, creating big, high standing waves before reaching the dramatic gorge known as Hawks Nest five miles north of Port Jervis. The spring high in the Upper Delaware is usually gone by June, but there's always plenty of water because the Delaware River Basin Commission mandates releases from five reservoirs to maintain a minimum flow of 1750 cubic feet at the Milford-Montague gauging station. A busy stretch near Lackawacksen, PA.
At Minisink Island, the river's largest, between Milford and Dingmans Ferry there's no sign of civilization, no road sound. Water birds and eagles live along the narrow water, spiced with lots of little ripples. At the southern tip you can paddle up through the island where a stream flows when the water is high enough. The whole bank is covered with rhododendron. And when they're blooming its perfectly gorgeous. And then in August everything is wildflowers. Yellows and fuchsia and cardinal flowers! Each section of ther river is different and has its own personality. But if you want easy, wide water with lots of wildlife, the stretch that flows through the Delaware Water Gap National Recreation Area from Milford to the Water Gap offers a bounty of day and overnight trips. Minisink, then Namanock, are the first of many islands along this stretch of river, where the water begins to form pools. Below Dingmans lies Shapnack, really a peninsula that gets cut off from the Pennsylvania side when the water gets high. Next is Bucks Bar. The Park Service calls it a bar but its really an island. Islands become markers for river sojourners through the National Recreation Area, which had its origins from scuttled plans for a dam at the island called Tocks. The dam would have made the river above it a huge reservoir. However, Tocks remains, along with Poxono, Depew, Sambo, and the rest, as stops along a gentle, easy ride spiced with beaver, bear, wild turkey, egrets, heron, and eagles. River camping is allowed at designated National Park Service sites on many of the islands, limited to boaters traveling from one access to another, when the distance between those points is too great to be covered in one day. Campers can stay only one night at each area. 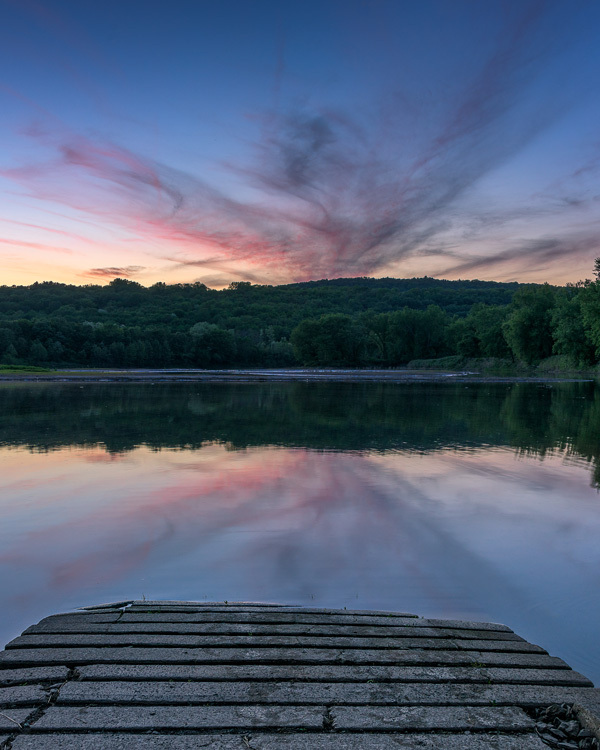 Walpack Bend is located just downriver from Bushkill, Pa., with Flatbrookville the nearest New Jersey town. The course of the river here is deflected by high, rocky ridges so that it completely reverses direction twice in the space of a mile or so. Nowhere else in its entire length does the Delaware make such a spectacular reversal. The river here is squeezed by ridges and mountains on both sides, creating a faster water flow and some very respectacle rapids. As you push off, the river seems straight and wide but even from here, looking downstream, you can see a mountain apparently blocking the way. The left bank of the river is a ridge of rock. As you proceed, you're sure the river must disappear down a giant drain; it seems to go as straight as an arrow into the mountain in front. Suddenly, the rock wall which was the left bank of the river, disappears and the river rushes through this breech, turning eastward and then northeastward, completely reversing directions. It is just at this breech that the Bushkill River enters on the right. The rock ledge that was originally the left bank now appears on the right, only much higher. Near water level it is a shear wall but as it rises, it slopes slightly and is covered with hemlocks and a few hardwoods. The main channel of the river hugs the right bank in the shade of this imposing cliff wall and the water is deep and dark. Occasionally, huge sharp, angled boulders broken off ages ago from the cliffside, appear suddenly in the dark depths of the water, some reaching up within inches of the surface. Both eagles and red tail hawks are a common sight, soaring with mates above the river, calling to each other. As you speed around Walpack Bend, the river widens somewhat and becomes less deep. The huge boulders are exposed all across the river creating rapids, the ominus roar of which gives fair warning. Again, the river is racing toward a drain, it would seem, for blocking its passage is the Kittatinny Range, highest in New Jersey. Again, at the last minute the river turns, this time to the south, seaward. At this bend another mountain stream enters, the Flat Brook, from the New Jersey side. Now the river assumes its rightful direction, the high forested Kittatinny Mountains on the left bank. The Walpack Bend experience is almost complete but wait. Again, you're greeted with an angry growl, the roar that portends white water. Indeed, in the distance it can be seen-white, frothy water leaping up. As you near the rapids, actually a series of three, you can see the "V" pointing downriver, indication of your route. The "V" pointing upriver indicates submerged boulders; there are many of these. The canoeist in the bow will earn his keep. Kneel in the canoe to give you more stability. If you haven't done so already, don your life jacket. And good luck. When you've passed through the third rapids you've completed the most exciting stretch of white water in the New Jersey section of the river north of Foul Rift at Belvidere. And more significantly, you've experienced a canoe trip of exhilerating beauty and solitude. You've passed through a true river wilderness--Walpack Bend. If you look at a map of Warren County south of the Delaware Water Gap, you might conclude that there is an easy trip from Belvidere to Phillipsburg. It certainly looks like a simple thing to do, except for the two four-letter words you can see on a map: Foul Rift. From Belvidere, just before the gigantic concrete cooling towers of the coal furnaces of the Metropolitan Edison power plant, you come to Foul Rift, perfectly named as one of the most severe rapids on the Delaware. Beginning canoeists should avoid this area all together. The river drops 22 feet in one-half mile. There is no developed portage around the rapids, and it is a task even during moderate river levels for canoeists to beach on the rocks on the New Jersey side, then carry their canoes along the sand bars and ledges to calmer water. The Recreation Map published by the Delaware River Basin Commission offers the following advice for canoeists: "Foul Rift deserves a special word of caution. None but the most experienced and best equipped boater should venture into this area. The only assurance of safe passage is to portage around the entire area or to lower the unmanned boat by line." More tranquil canoeing can begin five miles south of the rapids near tranquil Martins Creek. The sights below Martins Creek makes one forget the cares of civilization, and there are places where the banks seem as they were when the Dutch explorers first viewed the Delaware three centuries ago. There are a few "Class 1" rapids in narrows around islands about two miles from the Martins Creek access ramp. A Class 1 rapid is the most gentle of all the six rapids classified: a few riffles and small waves, but no obstructions. Of course, as every canoeists knows, with every passing storm, a Class 1 may become a Class 2 or higher because a tree could have fallen in the water, or a few boulders shifted position. There are no rapids above Class 3 on the main stem of the Delaware. An "eddy" in a river is a whirlpool of water usually caused by another stream flowing into the river. Sandt's Eddy is one such place. There is also an access area there operated by the Pennsylvania Fish Commission. Years ago, when boatmen brought goods up the Delaware, boats were "overnighted" in the calmer waters of eddies -- Dingmans Eddy, Upper Black Eddy, as well as Sandts Eddy. Further south is Hog Rift. The rift is so named because at one time a great number of hogs, fatally poisoned from eating rancid distillery slop, were thrown into the river nearby. Their bloated carcasses came to lodge along the riverbanks. It took more than a few high waters to wash away the remains, but the name stuck. Near Easton, about ten miles from Martins Creek, is Getters Island, a slender upstream tip nearly touches the Pennsylvania riverbank. The island is named for Charles Getter who, in 1833, was publicly hanged on the island for the murder of his wife. In 1860, the steamboat Alfred Thomas exploded while beached at Getters Island, killing at least ten passengers. 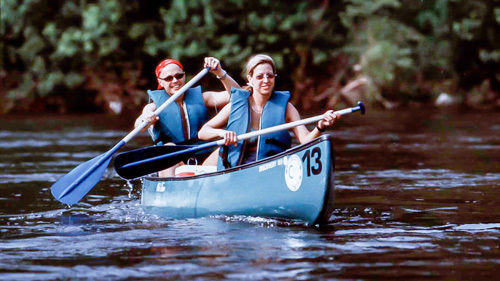 Canoeing the Delaware can also begin at Phillipsburg, and proceed south from there. Across the water you can see the confluence of the Lehigh River with the Delaware. The Lenape Indians of the area called the Lehigh River the "Lechauwiechink", and early settlers called it the "West Branch of the Delaware", the main stem of the river was the "East Branch", and the confluence was the "Forks of the Delaware". Years later, the Lehigh was recognized a river of its own and the given the name we use today. The canoe or kayak trip south of Phillipsburg can be as rewarding as one which starts at Martins Creek. You pass Old Sow Island, and then the community of Raubsville, Pennsylvania. Years ago, before there were so many bridges across the Delaware, Raub's Ferry took passengers from New Jersey to Pennsylvania and back. Ferries could only operate where the river was consistently deep and calm enough to carry passengers safely. Never more than on a hot summer's afternoon does this cool, clean serenity invite complete immersion as the water broadens, splitting Hunterdon and Bucks counties. Friends and family enjoy getting down this section by a never-ending variety of methods. Stand on the pedestrian bridge at Bull's Island State Park, nine miles south of Frenchtown, and you will watch canoes, sailboats, rafts, kayaks, jet-skis, and small motorboats map a tapestry of tracks in the water. Through the indiscriminate labyrinth of wakes float the coolest of customers; the tubists. Effortless and inexpensive, drifting at the river's leisurely flow of 1.5 mph in an inflated oversized innertube is the supreme expression of aquatic relaxation. However you choose to ride the river, you'll find the stretch of water that divides Hunterdon and Bucks Counties accommodating, hospitable and pristine. Knowing the river- its beauty, history, and its hazards- can provide you and your family with many days of enjoyment this summer. If possible, plan your trip for a weekday, and you'll feel like your have the river all to yourself. Liveries run by seasoned professionals along both the New Jersey and Pennsylvania, banks, can assure you of a safe trip with consistently up-dated equipment, the convenience of shuttles from end to end, and words of advice that will make your trip the best it can be. Things haven't changed that much in 120 years! Check this account.... "The author fraternally dedicates this reminiscence of a pleasant vacation trip to those canoemen, who, when the spirt moves them, laying aside the thoughts of business for the pleasure of grasping the double blade, gladly leave behind them brick walls and the dust of towns for the eye-resting wooded hills, the clean and wholesome waterway, and the health-giving tonic of woodland odors and cool mountain breezes." - Two Hundred Miles on the Delaware River, 1893. Fifty years of family fun for all ages! 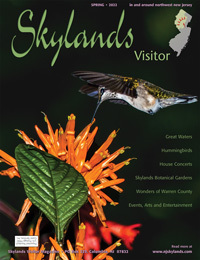 Tubing, calm water rafting, canoeing & kayaking trips on the Delaware River in historic Bucks County (near New Hope, PA). "We love to see you wet!" 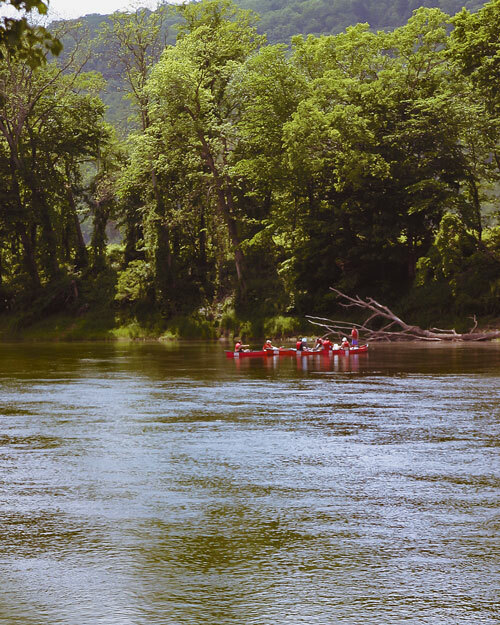 This family operated full service recreational livery for canoe, kayak, raft and tube provides one or multi-day trips for groups of all sizes on the scenic Delaware River. With over thirty years of experience, customer service is our strength. 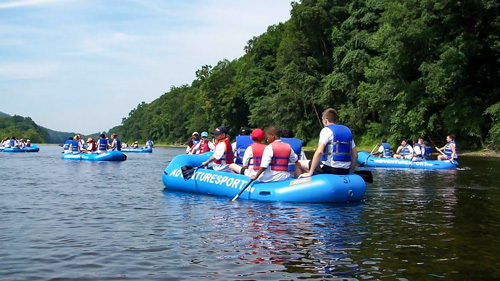 Licensed by the National Park Service, Adventure Sports has been running trips on the Delaware River since 1969. We specialize in trips through the spectacular Delaware Water Gap National Recreation Area that vary in distance, and can last from two hours to overnight multi-day camping trips. Two miles off I-80, exit 309.